Advisor conference organizers face a conundrum when it comes to the final day of the show. Editor-in-Chief Jamie Green sets aside his Mets pride to consider wisdom from former Yankees shortstop Derek Jeter. Advisor conference organizers face a conundrum when it comes to the final day of the show. On that getaway day, many attendees are itching to get home, so you want a big-name speaker to entice attendees to stay until the very end of the show. However, the last thing you want is to have said big-name speaker address a half-empty house, so it’s a bit of a gamble to spend the big bucks necessary to get a bona fide star to wrap up your show. Schwab took a leap at its 2004 Impact conference in Philadelphia when its getaway speaker was Bill Clinton—I recall seeing scores of roller bags lining the general session room while the former president spoke. 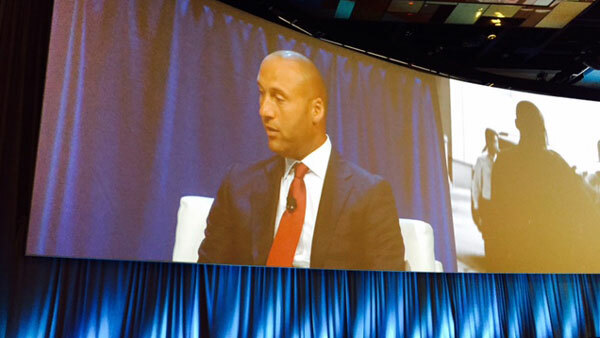 At Pershing Insite 2015 in Orlando in June, the final-day, final-session speaker was former New York Yankees shortstop Derek Jeter, who kept most of the 2,380 attendees in their seats. Plenty of big names spoke at general sessions during the conference, but the buzz was about Jeter, who sparkled in a conversation with Pershing CEO Ron DeCicco. Jeter spoke passionately about his own charity, the Turn 2 Foundation, a leadership program designed to help kids stay drug- and alcohol-free while helping them “Turn 2” healthier lifestyles. DeCicco mentioned that Jeter launched the foundation in 1996 following his rookie season with the Yankees. That made me like Jeter a bit more. After all, way before becoming a big-time star in his 20-season career with the same team, he was already giving back to the community. My next thought was that he probably had a good advisor who suggested a foundation early on as a way to both do good and do well. Jeter was drafted by the Yankees in 1992 and a day after his 18th birthday got an $800,000 signing bonus. Promoted to the majors for the 1996 season, Jeter earned the minimum major league baseball salary of $130,000. As his baseball star rose, so did his income. His salary during his career was in the neighborhood of $270 million, and then there are his endorsement deals. Forbes put Jeter’s 2014 endorsement income at $9 million in a year in which his Yankees salary was $12 million. Advisor Mark Cortazzo of MACRO Consulting Group was quoted on CNBC.com last year as estimating Jeter’s net worth at around $185 million. The Turn 2 Foundation has annual revenue, and expenses, of slightly over $3 million most years, according to its IRS Form 990s. Advisors who work with professional athletes (or entertainers) will tell you that these young people struggle with their newfound wealth, and not just because their days as a professional athlete will be numbered—the average career in major U.S. sports is between three and five years. As Jeter mentioned in his talk at Insite, most elite athletes have devoted themselves to their one sport at the expense of all other endeavors, including academics. And many athletes come from poor families where there is little understanding of how to deal with the fame and fortune professional sports provides.